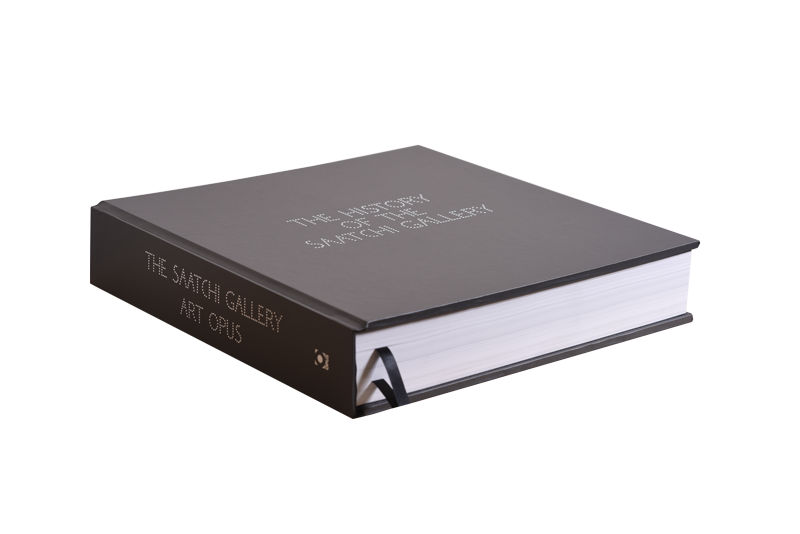 The Saatchi Gallery Art Opus features a monumental 850 pages each measuring half a metre square, weighing 40kg. Every copy is printed and hand bound by the finest craftsmen in England. Each edition signed by Charles Saatchi himself. The Saatchi Gallery Art Opus is limited to 100 copies. The Saatchi Gallery Art Opus features essays from Richard Cork, Brian Sewell, Steve Martin and Sir Norman Rosenthal accompany the artwork of 150 international contemporary artists such as Frank Auerbach, George Baselitz, Jake and Dinos Chapman, Eric Fischl, Lucian Freud, Andreas Gursky, Damien Hirst, Donald Judd, R.B. Kitaj, Sarah Lucas, Brice Marden, Robert Morris, Ron Mueck, Bruce Nauman, Paula Rego, Jenny Saville, Frank Stella, Andy Warhol, Rachel Whiteread, Zhang Xiaoghang and many more. Over the years, The Saatchi Gallery has launched the careers of many young artists who have since become household names. For the first time one giant limited edition Opus book, The Saatchi Gallery Art Opus, chronicles the breadth of work exhibited at The Saatchi Gallery over the past two decades from Lucian Freud to Damien Hirst and Andy Warhol to Zhang Xiaoghang. The Saatchi Gallery Art Opus is divided into seven sections, each reflecting different aspects of the work which has been exhibited over the last twenty years, including the infamous Sensation and controversial Young British Artists, as well as The Triumph of Painting and New Chinese Art.